With 3 new fluency students on my caseload I have been struggling to find homework for different strategies. I found myself hand writing notes to parents, eating up precious therapy minutes! With a little trial an error I came up with a solution to that! Labels! 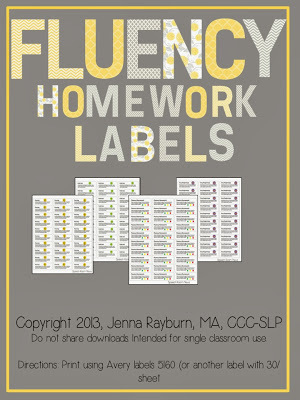 Fluency Homework Labels to be more specific! 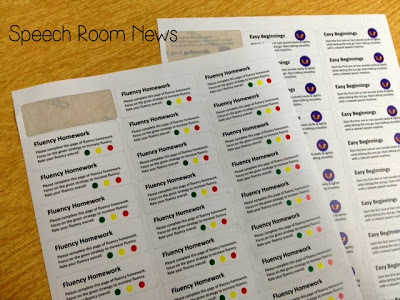 Instead of buying another book with homework pages, I created these fluency homework labels to add to other worksheets. I can add them language, grammar, or articulation worksheets. I’ve found that adding them to articulation worksheets especially gives me the flexibility to have students work at the work, phrase or sentence level with their fluency strategies! 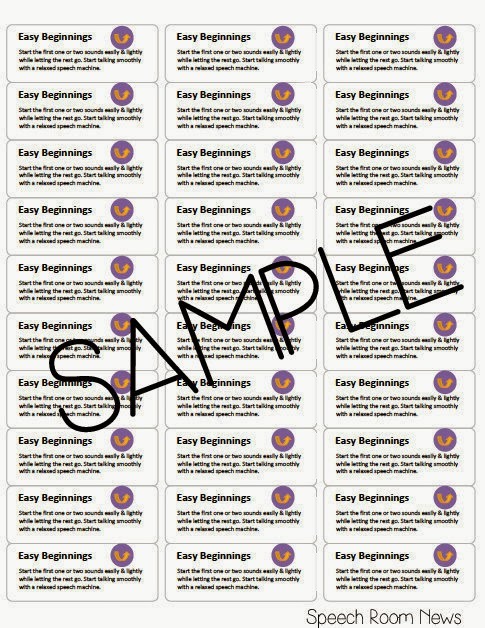 These are label templates that can be printed on the Avery 5160 labels or other label sheets with 30/pages per sheet. 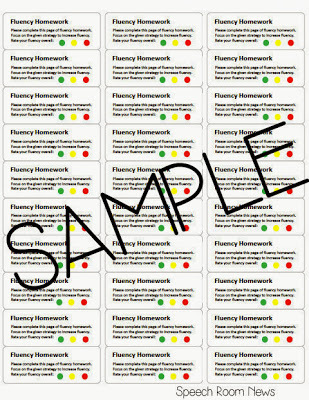 The homework rating label sheet includes a set of directions that tell parents to use the included strategy to complete homework. It also had a red, green, and yellow dot. Have your student reflect on how fluency they were during the homework. This feedback can be discussed when the student returns the homework. 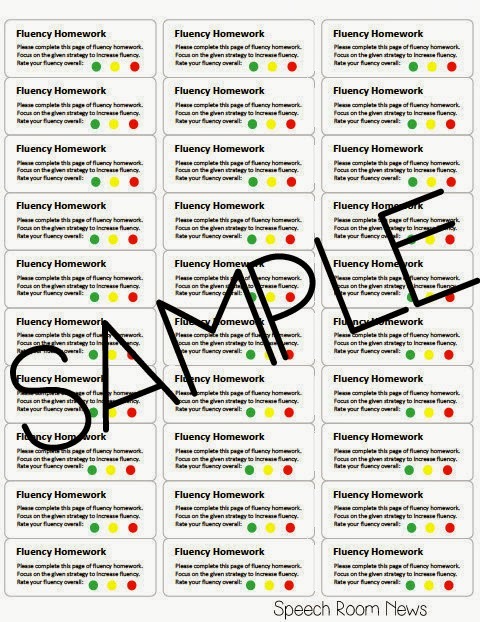 Included in the download is a cover page, a homework rating page of labels, and 9 different fluency strategies sheets. The strategy sheets include: belly breathing, eye contact, wait time, pausing, turn taking, cancellations, pull-outs, easy beginnings and fake stuttering. 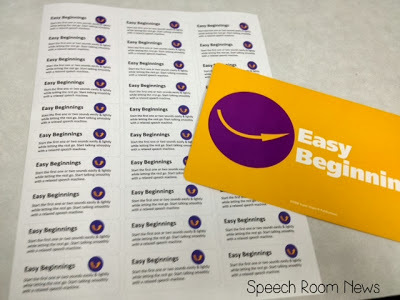 Each sticker includes the strategy and a summary (for parents and the student). I print labels and keep them in the students’ working files. 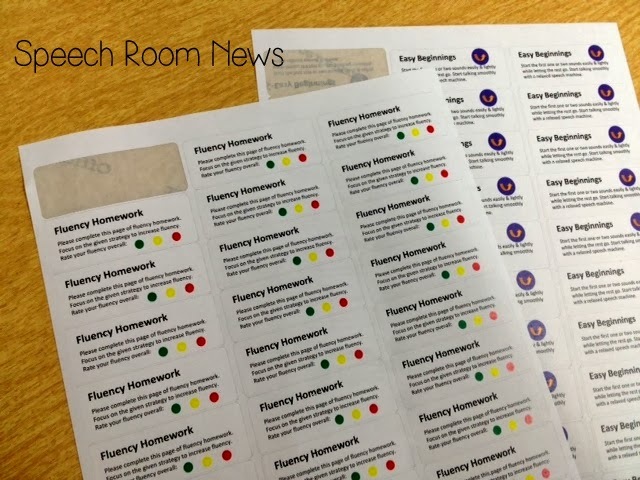 I used symbols similar to the Focus on Fluency Kit because that’s what I use with my students. On each page of homework, I add the homework rating label and one of the strategy labels. **Please note this product is meant to be printed on Avery 5160 labels. **Please note this a zipped file. You will need an unzipping file to open. 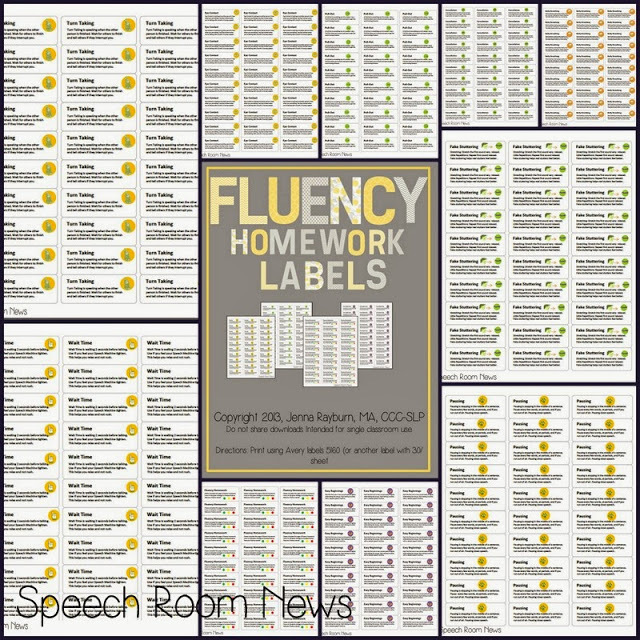 Head over to Teachers Pay Teachers to grab my Fluency Homework Labels! Here’s a link to the Avery labels needed (amazon affiliate link included for your convenience!) What are you using for fluency homework? How to do quickly communicate the strategies to parents? I am only a few weeks into my CF so I haven’t started sending homework for my fluency students, but this would be a great way to start building a home program for these students! What a great idea! I would use the same type of worksheets (language, artic, ect) for my fluency students and write the strategy(ies) to use at the top of the page. This is not only a time saver but helps parents understand what the student is supposed to be doing as well. Nicely done! Oh heck, where has this been! What a very useful idea. Nicely done, indeed. I’ve been writing the homework! I send home cards with the task written. This would be a great help!! I’ve also been writing the homework! I have 4 fluency kiddos on my caseload, and I am a CF with limited materials. You’re awesome! Just added two new ones to my caseload! This would be great! This is such a good idea! In fact, this would be great for articulation and language homework too. I don’t have a lot of fluency kids on my caseload, so I don’t have a lot of materials. Right now, we haven’t sent too much homework home as it is. Thanks for making these! 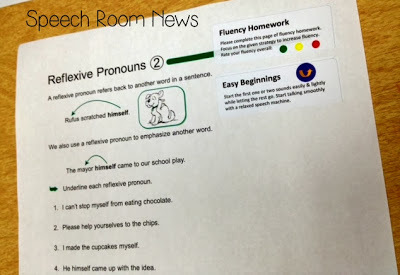 I’ve never given fluency homework, but I LOVE this idea! GENIUS!! Fantastic idea! I think fluency homework is the hardest to come up with! Typically give homework to practice sentences, read a story, or tell their sibling/parent/relative what we did in speech today using a specific strategy. Love this- and I think it would be more motivating for them to do their homework- who does not love stickers, organization, and directions that are easier to understand. So creative! Thanks for sharing! 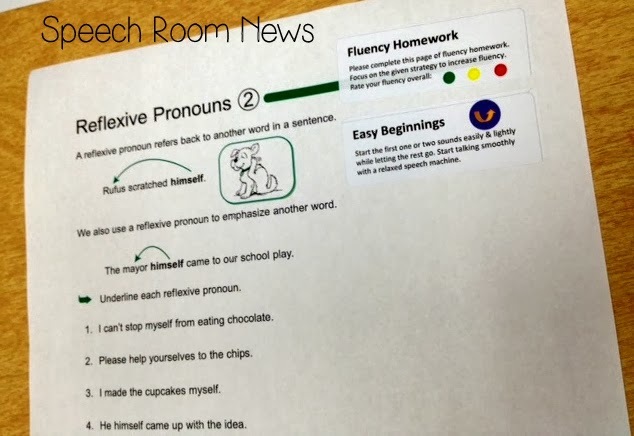 This is a fantastic idea and would save a lot of SLPs from writing out fluency hw every week! I send home the homework that is included in the Focus on Fluency manual. great idea for lots of things!!! thank you for sharing! I just received a fluency child this year! So excited to start! Excellent idea Jenna! I have not really sent homework for fluency. I LOVE labels (it’s an obsession)! I’m going back to Easy Does it For Fluency and re-learing all the word initiation techniques right along with a new student. What program/resource did you use for your fluency facilitating techniques on your labels? I only have one fluency student now and havent given her homework recently. I think the labels are a great idea! great idea! I have made calendars with 3 assignments per week, with tasks similar to my artic kids–practice easy onset on 3 things you find in the refrigerator, etc. I have not sent fluency homework in a while! I would like to try yours! These are awesome. Thanks for sharing!! I use month by month articulation and have the kids talk about topics using their fluency strategies. This is a great idea! I have been searching every where for Fluency Homework!!! Thank you thank you thank you!!! I would love this!! I have been writing my homework! I love this!! You are awesome! I haven’t been giving fluency homework, other than requests for role-play situations, but I love this idea! I haven’t had any fluency students to date but just received notice today that I will be getting a move-in student who is being seen for fluency. 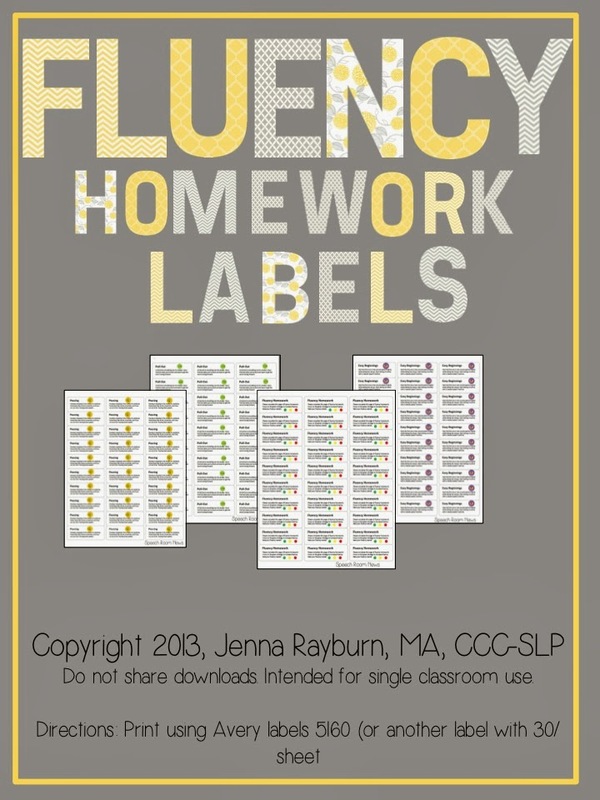 I know there is one fluency workbook that is quite dated currently in my collection of materials from the previous SLP but I could really use simple and fast homework! In all honesty, I haven’t sent much home for fluency homework. If I do, it is usually some type of game using a carrier phrase that we have been using in therapy while implementing a certain fluency enhancing technique. I always struggle with fluency HW…I typically do what you were previously doing and hand write what I want them to practice at home. This is such a great idea! What a great idea! Your creativity is amazing…Would love to try these sticker out! I use similar worksheets for homework and find myself always writing notes to the parents – this would be a great time saver!! Great product!! My fluency homework is well….writing notes home or a phone call. I don’t have fluency homework (that’s why I need these!). Just reminders to use the techniques when speaking with others. I haven’t had a fluency case in a few years….this year I have two. NEED THESE!! It is so hard to give homework for fluency. I love this idea to use the labels to remind the kids to use strategies along with another activity. Genius! Depends on what stage of treatment they are in. I often recommend breathing exercises and practice easy oneset and pullout strategies when reading. I need these to get me jump-started. I do the same darn thing you do! 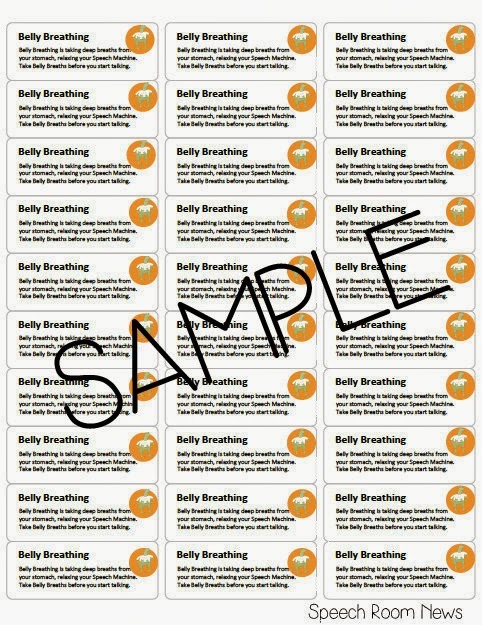 These labels would save lots of time! This looks terrific Jenna. Thank you! Such a clever idea! And it doesn’t require a ton of prep time! i like to read these kind of creative posts…..The homework rating label sheet includes a set of directions which is really helpful for parents like me. It also helps student to improve their fluency during homework. It is totally a great piece of knowledge for all my friends who care about the future of their children. Thanks! !